The International Foundation High Altitude Research Stations Jungfraujoch and Gornergrat (HFSJG) is a foundation in accordance with Article 80 ff. of the Swiss civil law. It has its headquarters in Bern, Switzerland, and is under the auspices of the Swiss Federal Department of Home Affairs. The aim of the Foundation is to make possible scientific research that must be carried out at high altitudes or in high alpine climates. 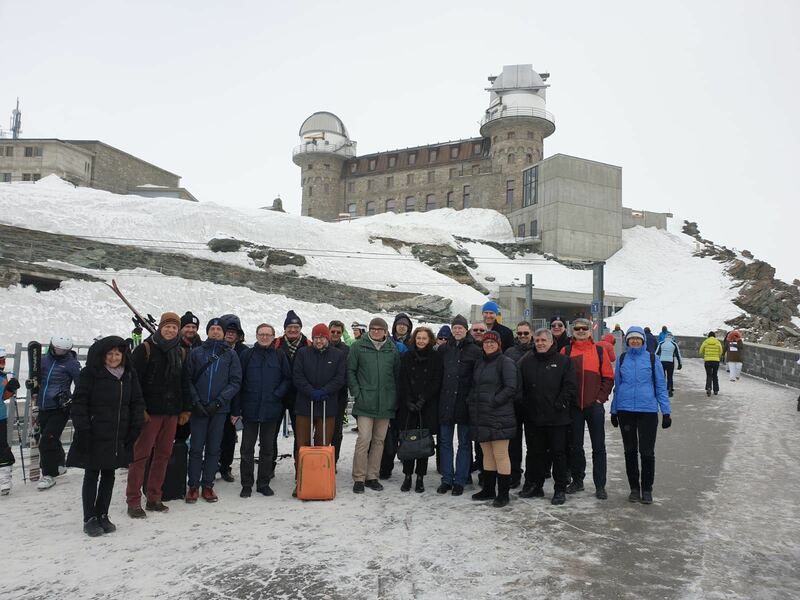 The Research Station and Sphinx Laboratory at Jungfraujoch, together with the two astronomical observatories, Gornergrat South and Gornergrat North, are run for this purpose. Scientists from universities, schools of technology, and research institutes of the member countries, and upon request from other countries, can carry out research experiments in the laboratories and observatories provided by the Foundation. Administrative assistance and information are provided by the Foundation’s offices that are located in the University of Bern, Switzerland. HFSJG is under the direction of the Foundation’s board. The board meets every two years and is composed of the president and two representatives from each member institution. The president must be a Swiss citizen. He and the director are nominated by the Jungfraujoch Commission of the Swiss Academy of Sciences (SCNAT) and elected by the SCNAT. One of the two Swiss representatives of the SCNAT acts as treasurer. The Research Station at Jungfraujoch is the property of the Foundation HFSJG and comprises five laboratories, a mechanical workshop with a small equipment room, library, a dining and recreation room, kitchen, ten bedrooms, bathroom with shower, and the custodians’ apartments. An air compressor is also available to supply liquid nitrogen as a coolant. The Sphinx Laboratory is part of the Sphinx building and belongs to the Sphinx AG Jungfraujoch, a subsidiary company of the Jungfraubahn Holding AG. It is at the free disposal of the Foundation. It has an astronomical dome, two large and two small laboratories, and a weather observation station. The observation instrument in the astronomical dome is a 76 cm telescope with Cassegrain and Coudé focus, and is part of the solar spectrometer of the Institut d’Astrophysique et de Géophysique de l’Université de Liège, Belgium. All laboratories of the Research Station and the Sphinx Laboratory are equipped with 230 V / 50 Hz / 10 A and 400 V / 50 Hz / 15 A and with outlets for phone connections as well as internet connections. The laboratories are also supplied with cold water. Two custodian couples alternate in supervising the Research Station on site. The train ride from Interlaken Ost to Jungfraujoch by either route takes about 2.5 hours. Researchers who are allocated a working place in the Research Station or in the Sphinx Laboratory must bring with them all necessary instruments, auxiliary equipment, and tools. They are also personally responsible for setting up and carrying out their experiments. Two workshops are at their disposal for small mechanical, electrical, and electronic work. The custodian will assist, if possible, with the mechanical work that needs to be carried out in the Research Station’s workshop. A refrigerator is available to the scientists in the Research Station. For experiments that need cooling, liquid nitrogen is available from the custodian. The researchers are responsible for their own meals. A well-equipped kitchen and a dining room, which also serves as a recreation room, are at their disposal. Orders for food and drinks can be given to the custodian from Monday through Friday. The provisions will be ordered from the valley and will normally be delivered at Jungfraujoch within 2 days. The library, which serves as a reading room, is also open to all researchers. If possible, a single bedroom will be assigned to each researcher. Emergency accommodations can be installed when there is a large number of researchers in the Research Station. Because of the high altitude and the isolation, life and work at Jungfraujoch make great physical and psychological demands. Experience has shown that in general the researchers at Jungfraujoch do not have the same working capacity and are more irritable than at lower altitudes. If possible, researchers should not stay at Jungfraujoch for longer than approximately four weeks at a time. If any research work could disturb or encumber the operation of the Jungfrau railway, effect tourism, or conflict with the guidelines of the UNESCO World Heritage Jungfrau-Aletsch, or any ongoing experiments, it may only be carried out after obtaining permission from the director HFSJG. In particular, work should be planned such that the location’s environment be restored to its original condition after the conclusion of the experiment or field campaign. The director may require a written statement thereto from the principal investigator after the conclusion of the experiment. Researchers who go out on the glacier are asked for their own personal safety to inform the custodian in advance. We strongly recommend use of proper equipment and clothing, a mobile telephone and if necessary a guide. The Research Station cannot be held responsible for accidents. Applications for new research projects are welcome at any time. Scientists who intend to work at Jungfraujoch should contact the director’s office in Bern well in advance. A simple written inquiry is required at least three weeks before the starting date of the project. In general, a reconnaissance visit at Jungfraujoch with a representative of the Research Station is required. If the direction HFSJG approves the project, the researcher will receive an application form from the secretary’s office for the final, binding details concerning the research and its duration. As soon as this form has been reviewed and approved by the director, the secretary’s office will issue “legitimation” cards for the project. The legitimation cards not only authorize work and stay at the Research Station Jungfraujoch but, moreover, oblige adherence to the conditions contained in these regulations. The legitimation cards also permit the holder to purchase reduced-priced railway tickets to Jungfraujoch at the railway stations in Interlaken Ost, Grindelwald Grund, and Lauterbrunnen. If any changes occur in the travel plans or in the composition of the group before or during the stay at the Research Station Jungfraujoch, the secretary’s office should be informed immediately. The stay at the Research Station may only be prolonged by authority of the director. Researchers involved in approved projects at the Research Station Jungfraujoch must ask for the administration’s approval prior to any stay that is not explicitly listed on the application form. This includes work done during the daytime without overnight stays. Medical experiments are required to provide further information, in particular, all experiments done on humans and animals are subject to the licensing requirements of the National Advisory Commission on Biomedical Ethics. The director has the authority to make special agreements. Sensitive measurements are in progress at the Sphinx that may easily be jeopardized by the activities of researchers or visitors. For details see the important information in the appendix. Researchers are required to be familiar with the contents of this information sheet. For the transportation of dangerous goods, special requirements must be adhered to. Current Information on transportation with the Jungfrau Railways can be obtained from the secretary’s office or from the custodians of the research station. The administration HFSJG can facilitate the import and export of scientific equipment and instruments on the Swiss side. This requires that at least two weeks before goods are to enter Switzerland, the researchers give the secretary’s office in Bern a list of the items to be imported, including weight, dimensions, value, and country of origin for each item, as well as the port of entry and expected date of arrival of the goods. With this information, the secretary’s office will fill out an official declaration (form 11.32) for duty-free importation of the listed goods and send this form to the Swiss customs office in Bern. In almost all cases, the Swiss customs will grant duty-free import of equipment and instruments for research purposes at Jungfraujoch. The 11.32 form will then be sent from the Swiss customs back to the secretary’s office. Finally, the secretary’s office will forward the 11.32 to the designated researchers or transport company responsible for the shipment. For the exportation of the equipment, the secretary’s office has to fill out and hand in the form 11.030 to the customs office in electronic form. The form 11.030 can be handed in no earlier than 30 days before the date of exportation. The secretary’s office will print out the confirmation of the customs office (called Bezugsschein) and forward it to the researcher or transport company responsible for the shipment. The 11.32 must accompany the instruments and equipment upon importation, the Bezugsschein upon exportation. Both documents must be presented at one of the larger customs offices at the Swiss border during customs office hours. The customs office in Bern will provide one day processing of the 11.32, and our office will forward the 11.32 within one working day. That means that it will take 3-4 working days from the time we have all the information needed for the 11.32. Nevertheless, it is important that the researchers provide all information with sufficient time for mailing the forms. A processing time of 3-4 days cannot be guaranteed if the secretary is absent. The costs of operation and upkeep of the Research Station and the Sphinx Laboratory are only to a small degree dependent on the number of occupants, which may vary considerably. For this reason, the financing of the Foundation is on a subsidy basis rather than on a consumption basis. Accordingly, all member countries make an annual contribution. For the use of the Research Station a nominal fee is charged in the form of an overnight tax. The researchers are responsible for their own outgoing mail. Every group working at the Research Station will receive a cordless phone on demand with its own number during its stay. The phone calls will be invoiced. The use of the University of Bern’s network is subject to the university’s security regulations. It is prohibited to alter or expand network components of the network of the Research Station Jungfraujoch unless explicitly approved by the Abteilung Informatikdienste of the Universität Bern. In particular, wireless equipment of any kind that augments the network of the Research Station Jungfraujoch and the use of managed switches must first be approved by the Informatikdienste of the Universität Bern. For experiments that consume large amounts of electricity, water, or liquid nitrogen, or that require special services by the custodians, the administration can ask for a contribution toward the expenses. If a research group foresees a long-term research project in the Research Station or Sphinx Laboratory that will occupy a working place or laboratory even in the researcher’s absence, this must be clearly stated in the application for a working place. As a rule, contracts made with research groups require an indemnity for long-term occupation of a working-place. A research group that plans to run automatic apparatus that is continually in operation and that needs supervision by the custodian must state this clearly in its application for a working place. The application can only be approved by the direction HFSJG if the supervision work by the custodian is within reasonable limits of time and effort. Upon granting the application, a contract will be drawn up between the Foundation and the research group stipulating the duration of the experiment, the duties of the custodian, and the indemnity. All research work and equipment, including transportation, installation, maintenance, and supervision by the custodians, is at the entire risk of the respective research group. Group leaders are responsible for enforcing the safety rules in handling dangerous goods. Neither the Foundation nor the custodians can be held responsible for damage or accidents. Adequate insurance is the sole responsibility of each research group. Research groups must send a pdf-version of all such publications to the Foundation’s office in Bern. In accordance with the rules of the Swiss National Science Foundation, the Foundation HFSJG requires that all published and peer-reviewed journal articles listed in the activity reports be accessible in their entirety on internet – either on the research institution’s home page or other server – as long as there are no legal restrictions to this access. Each year the Foundation may request that a summary of each research project carried out at the Research Station be submitted by the principal investigator. This summary may be included in the Foundation’s annual activity report that will be available in hard copy and on the Foundation’s web site. This activity report is an integral part of the Foundation’s annual report and the periodical grant applications to the Swiss National Science Foundation. updated in June 1999, November 2002, April 2004, December 2008, and July 2016 by the Direction HFSJG. On the application form for a working place, a responsible leader must be named for each group that will be in the Research Station. The leader is the spokesman for the group in liaison with the other research groups, the custodians, the Foundation’s secretary’s office, and the direction. The leader is also responsible for the smooth operation of his / her group’s work. The custodians are the representatives of the director at the Research Station. Their instructions are to be complied with. Any complaints about the conduct of the custodians or of the staff of the Jungfrau Railways or of any other scientists are to be forwarded immediately to the director or to the secretary’s office in Bern. Quiet and order are requested in the Research Station and in the Sphinx Laboratory. The fact that the work and leisure times of the various research groups can vary considerably must always be kept in mind. Researchers are required to refrain from loud talking in the corridor and from making phone calls in the bedrooms. Upon arrival at the Research Station at Jungfraujoch, every researcher will be given a house key affording him entry to the Research Station, the Sphinx Observatory, his / her own working place, as well as to the older Sphinx lift reserved for researchers. The entrance doors to the Research Station and the Sphinx Laboratory are to be kept locked at all times. In addition to their allocated bedrooms and working places in the Research Station and Sphinx Laboratory, the following rooms are open to the researchers: the dining- and recreation room, the kitchen, the bathroom with shower, the library, and the two workshops. Upon arrival the group leader will be given a cordless phone on request. This phone has its own number and can be used for incoming and outgoing calls. All phone calls made by the group must be made with this phone, unless privately owned mobile phones are used. The kitchen, dining and recreation room should be left clean and tidy after use. All dirty dishes should be correctly placed in the dishwasher. The dishwasher should be started only when the machine is full. When two or more research groups are working at the station simultaneously, it is expected that the groups organize the use of the kitchen and dining room among themselves. If no agreement can be reached, the decision of the custodian or director is binding. A shower is available for the researchers in the bathroom. The researchers are asked to make economic use of water, especially during the winter and spring months. The library is primarily a work and reading room but can also be used for meetings upon approval of the custodians or the administration. Care must be exercised when using the tools, machines, and measuring devices in the workshops of the Research Station and the Sphinx Laboratory. All equipment must be put back in its proper place after use. Machines and special implements in the mechanical workshop may only be used with permission of the custodian. Researchers wishing to use this equipment must demonstrate their capability to use it correctly. The custodian’s instructions and appropriate safety rules are to be followed. The bedrooms are attended to daily by the custodians. The occupants should keep the rooms clean and tidy. Smoking is prohibited in the rooms. Further prohibited are washing large items of clothing in the washbasins and drying them in the room. Economy is requested in the use of the heating and electricity. It is prohibited, for example, to have the heating on with the windows open. Alterations on the working places can only be carried out with the approval of the custodians. Any damage to or defects in the equipment must be reported to the custodian at once. Smoking is forbidden in the research station, the Sphinx laboratories, the lifts and on the research terraces. It is forbidden to boil water in the Coudé room and Cassegrain room of the astronomical dome. Because of the high altitude and the isolation, life and work at Jungfraujoch make great physical and psychological demands. To avoid friction, the researchers should endeavor to be reserved and self-disciplined at all times. Further, the researchers are obliged to secrecy concerning the results of any experiments and investigations of which they have knowledge from their colleagues at Jungfraujoch. The assistance of the custodian may be requested for the incoming and removal of heavy instruments and occasionally for small services. The main work of the custodians is, however, to keep the Research Station and its infrastructure in working order and to ensure well-conducted, orderly operation. The assistance provided by the custodian and his staff is done so without any responsibility for damages. If any research work could disturb or encumber the operation of the Jungfrau Railways, effect tourism, or conflict with the guidelines of the UNESCO World Heritage Swiss Alps Jungfrau-Aletsch, or any ongoing experiments, it may only be carried out after obtaining permission from the director HFSJG. In particular, work should be planned such that the location’s environment be restored to its original condition after the conclusion of the experiment or field campaign. The director may require a written statement thereto from the principal investigator after the conclusion of the experiment. Researchers who go out on the glacier are asked for their own personal safety to inform the custodian in advance. We strongly recommend use of proper equipment and clothing, a mobile telephone, and if necessary a guide. The Research Station cannot be held responsible for accidents resulting from activities on the glacier. Researchers are subject to the regulations of the Jungfrau Railways upon entering and using the railway premises, the railway station, the Sphinx tunnel, the Sphinx lifts, and the Sphinx building open to tourists. There is a long-standing friendship between the Foundation and the Jungfrau Railways. The researchers are requested to treat the personnel of the Jungfrau Railways accordingly and to comply with their instructions. For its part, the Jungfrau Railways holds its personnel responsible for assisting researchers to the best of their knowledge. In cases of disagreement or particular incidents that concern the Jungfrau Railways, the director HFSJG is to be informed immediately. Before departure the researchers have to personally hand over their working place and bedroom to the custodian. Any damages for which the researchers or research group is responsible will be noted in writing. All keys and the cordless phone must be returned, if applicable, to the custodian and all financial affairs taken care of such as costs for overnight stays, telephone calls, food and drink, transport, etc. Upon arrival the researchers are asked to pay careful attention to the instructions from the custodians on specific safety aspects and on how to behave in emergency situations (e.g. health problems, fire, problems with the lift etc.). The Research Station and Sphinx Laboratory are special fire hazards. Structural precautions for fire prevention and fire control are provided, such as the subdivision of the building into self-contained, separate fire sections. A fire alarm is also installed in the Research Station. Nevertheless, utmost care must be exercised to prevent fires. In case of fire, the custodian and researchers present are to be alerted immediately. Only then can the fire fighting equipment and fire extinguishers be put to use. This equipment is stationed throughout the Research Station and the Sphinx Laboratory. The lifts in the Research Station and in the Sphinx Laboratory are not to be used during a fire. In case of an extensive fire in the Research Station, the staircases of the fire escape ladders are to be used for evacuation. If possible avoid going outside except when escaping from the fire. on the 1st floor: through the opening in the corridor in front of rooms 22 and 23. Please consult the evacuation plans in the buildings.